The Basque Country is located in the very north of Spain, bordering with France. It is well-known internationally for its cuisine. The Basque cuisine is full of delightful fish and shellfish dishes, because of its location on the coast of the Cantabric Sea. There are four traditional sauces used for seafood in Basque cuisine: red, white, green and black. 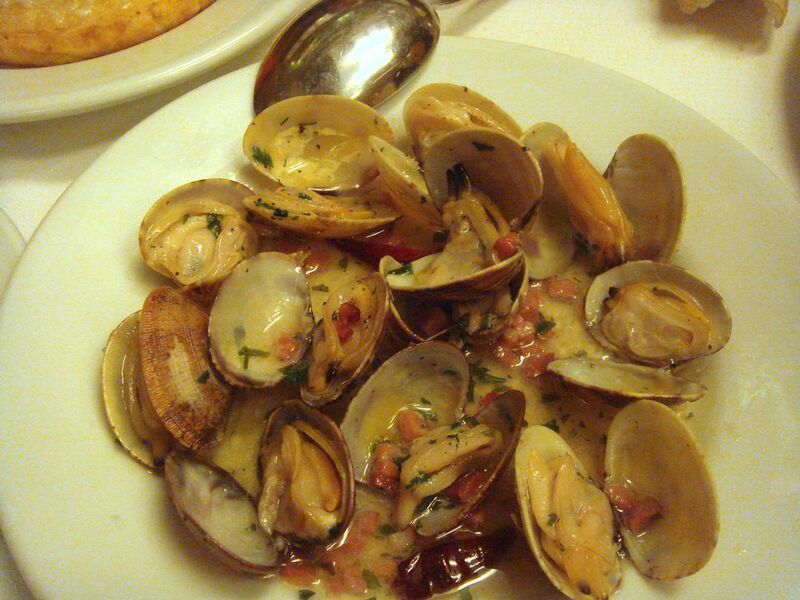 Clams in Green Sauce, or Almejas en Salsa Verde in Spanish, is a typical Basque tapa, with flecks of parsley sprinkled throughout. It's easy to prepare as an appetizer, first course. Add a bit of pasta to make the main course for a light dinner. Serve with a light white wine, such as Txakoli. Clean clams of debris, sand, etc. and rinse under cold water. Place in a medium saucepan and pour half of the wine over the clams, then add water until clams are just covered. Bring to a boil, then reduce to a simmer and cook until clams open. Remove from heat, and place clams on a plate. Reserve liquid for later. Finely chop the onion and mince garlic. Pour enough olive oil to cover the bottom of a large, deep frying pan and heat. When hot enough, sauté chopped onions, adding garlic after 3 to 4 minutes. When onions are transparent, reduce heat to medium-low. Add the flour and fry. Slowly pour in wine and reserved liquid while stirring. Add clams and simmer for 3 to 4 minutes until thickened. Adjust salt. Finely chop parsley. Sprinkle parsley into the pan. Stir mixture. If the sauce is too thick, stir in water a bit at a time to thin. This tapa can be made into a first course by adding spaghetti or linguine. While preparing clams and sauce as directed above, prepare pasta. The recommended serving size is 2 ounces of uncooked pasta, which equals approximately 1 cup of cooked pasta. So, cook 1/2 pound dry pasta to serve 4 persons.